I planned my walk early in the week. I decided to walk along a different water front. After meeting some friends for lunch downtown, I took a brisk walk along the Columbia River walkway. Being in the downtown, I mostly wondered what this walk would have looked like 100 years ago or longer before having man’s impact. Vegetation was sparse. I even wondered if the trees were native to our area. The river was wide and its color blended with the sky. Many walkers and joggers passed along the concrete walkway that had been made for a heavy traffic of people. I had a hard time feeling as at ease as I had the week before, but continued along as planned. I took pictures of the plaques that were occasionally placed along the walkway explaining history of the river and the settlement of the area. A feeling of disappointment hit as I finished my walk. There was still the beauty of the river and its banks, but I couldn’t help but feel a loss for what must have been its majestic beginnings. It was brought to this state all for the sake of progress. I didn’t plan my walk as early on, but decided that I would stick closer to home. 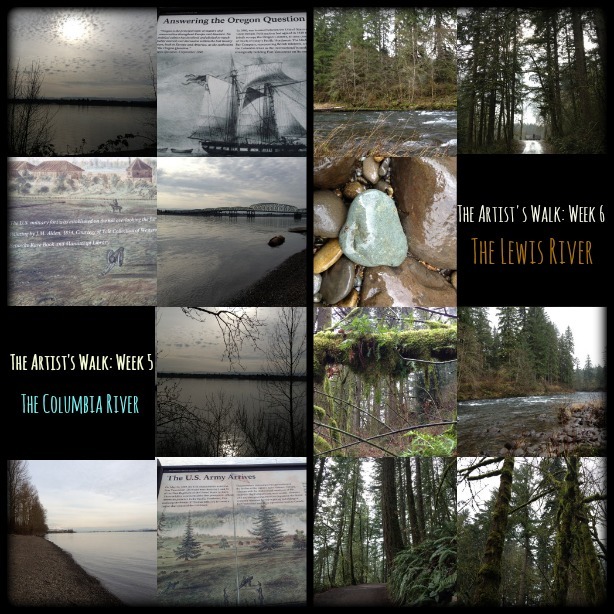 I went to Lewisville Park that is set down along the Lewis River. As I drove into the park the rain began to come down. I wasn’t going to let that spoil my walk though. My rain coat would keep me dry enough. The park was basically deserted. There were a line of cars parked outside of the park’s entrance (walkers, joggers, fishermen, and hikers regularly park there to avoid the entrance fee), but once inside the parking lots were empty except for the occasional truck. I wondered if there would be a possibility of animals up on the trail that I planned to walk along. I figured that I would make as much noise as possible. I went along the river bank first to look at the river. The rain was coming down hard enough that the rocks were slippery and I needed to protect my camera. The river always moves fast during this time of year and today was no exception. I found the entrance to the hiking trail and took my time walking up the steep dirt walkway. I stopped to admire ferns, moss, and so many beautiful trees. I forget how much I really love this setting. My way back I decided to put my camera away and really just enjoy being a part of so much greenery. I felt like I was breathing and relaxing deeply even with a brisk uphill then downhill terrane. At one moment I felt so happy and peaceful that I knew this was an experience that I would want to duplicate. I considered all of the factors that were in play. I was alone. Lush plant life surrounded me. The river roared below. Birds tweeted above. The rain had stopped and blue skies broke. Endorphins also must have kicked in after 45 minutes of walking up and down the trail. Would it be too much to ask for this place to stay unspoiled forever?